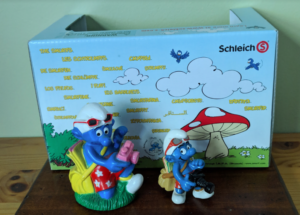 Did you know that in 1999, Schleich released six new smurf figurines and five new Super Smurfs? Some of these smurfs are now considered highly collectible as they were only produced for a very short period and also because their association with other smurf merchandise. For this week’s post I will only discuss the regular smurfs and next week I will discuss the Super Smurfs. For some reason #20451 was not used and remains a mystery why it was not used. 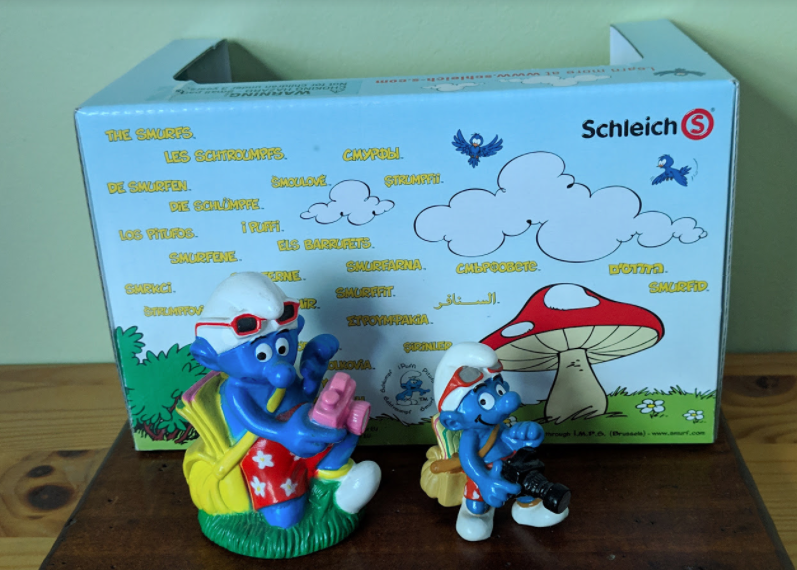 This was not the first or last time Schleich would miss a number when giving smurfs their article number. Tourist Smurf: We first saw Tourist Smurf in 1996 when it was sold as a candy topper. The figurine was produced using the same exact design and colours as the candy topper. Tourist was only made by Schleich for three years, 1999 to 2002. It was also the only regular smurf made out of China, whereas the others were made out of Germany. Tourist Smurf is carrying a satchel full of brochures over his shoulder while holding onto a black camera. He is wearing a light red/orange shouts with white details and his sunglasses rest on his white hat. Sportsman: No actual markings can be found on the smurf itself, as they located under the base. It was only produced for two years, 1999 and 2000. Sportsman is running along on a large green grass pattern base, tongue hanging out, with a stopwatch over one shoulder and a towel over the other. He is wearing yellow shorts and a white singlet. Aerobic Smurfette: Was first released between 1999 and 2001 then later used as part of the 1990 to 1999 Decade Box Set. So possible to find with two different markings. Lying her back, Smurfette has one leg in the air while wearing a pink leotard with matching leg-warmers. Newspaper: Commonly found with a bent right arm holding the newspaper upwards. An extremely rare version was also produced where the right arm is positioned more diagognial. Only sold for two years, 1999 and 2000. Carrying a satchel full of newspapers swung over one of his shoulders, while holding up a copy of the Smurfs News in his right hand. Has a hole in the bottom of the left foot. Smurf with Nameplate: Can be found with or without a hole in the white removable sign. The one with the hole, is considered more rarer. Was only sold for two years, 1999 and 2000. Wearing a yellow shirt, black pants and a white baseball style cap while pointing to a blank white removable sign. Golf Smurf: Just like Aerobics Smurfette it was first released between 1999 and 2001 then later used as part of the 1990 to 1999 Decade Box Set. So possible to find with two different markings. Golf Smurf carries his golf bag over his left shoulder while carrying a white golf ball in his right hand. Wearing a yellow shirt, orange checkered pants and brown shoes. If you would like to share any other information you may have on 1999 smurfs, please feel free to leave a comment.